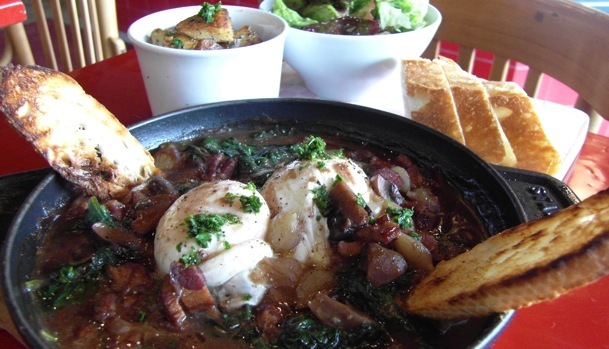 On the hunt for the best French food in Kitsilano? This might be it. The slew of pastries and paté loaves on display at Café Régalade froze me in my tracks as I entered Kitsilano’s new French bistro. Blueberry beet muffins, ‘Iles Flottantes’, and other captivating creations had me gawking for two minutes before I took my seat to read the menu. Several breakfast skillets, two quiches and a few paté-slathered sandwiches were among my options — all made in house by French owner/chef Steeve Rayé and his team. My French server recommended the Lyon Breakfast ($12.75) and I accepted. Shortly, presented beautifully on a cedar board, the skillet and its tasty sides arrived. Jam-packed with thickly sliced bacon, tender pearl onions, and saturated mushrooms — all swimming in a sea of gravy-like red wine sauce — the delicious spread was absolutely layered with intoxicating flavours. Bright yellow rivers of yolk poured from the soft poached eggs resting atop the mess of deliciousness. Café Régalade — now open for dinner, as well —is the second concept of Rayé’s to launch at his West 4th location. I hope for Vancouver’s sake that it’s here to stay.